The non-native oxblood lilies started blooming this week. I started with three bulbs. It looks like they need to be divided soon. The Liatris caught the attention of monarch butterflies. This damselfly is almost the same shade of blue as the flowers of Pitcher Sage, Salvia azurea. This is my third or fourth attempt over the years to try Pigeonberry, Rivina humilis. It is a shade loving plant in the pokeweed family that forms a 1 foot tall and wide bush. Mine always die before they get that large, so I bought a larger plant this time around. Pigeonberry has small spikes of white to pink flowers that are followed by berries. The berries change from green to white to red and are a favorite of many bird species. This yellow flowered plant is a mystery. It appeared on its own last year and returned again this year. The plant grows about two feet tall and has narrow leaves along the lower portion of the stems. The flowers are about the diameter of a pencil eraser. Any ideas as to what this plant might be? Thanks Rock rose for identifying Prairie Broomweed, Amphiachyris dracunculoides. The first gayfeather blooms of the season began to appear in the last couple of days. Unfortunately, this season may be a bust. Several of the gayfeather stalks have turned brown and died. Sometimes a few stems on a single plant die and other times all of the stems on a plant die. I am not sure what is causing the dead stems. It could be the drought. It could be a side effect of the damage caused in the spring when four-lined plant bugs invaded the garden. 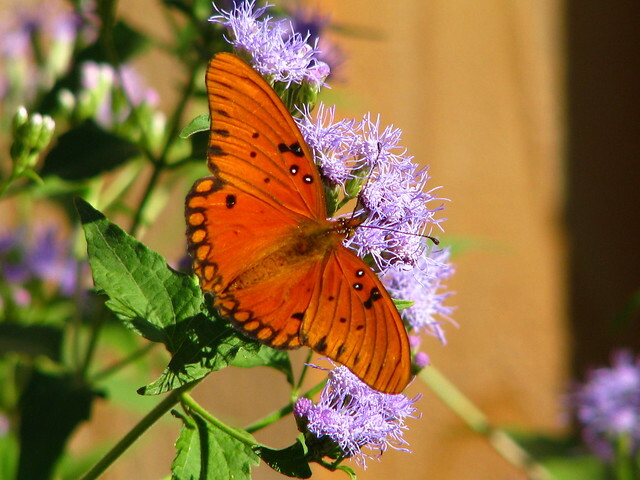 The primary targets for the bugs were the Salvia greggii, Gregg's mistflower, Conoclinium greggii, and Liatris. New leaves quickly covered the damaged leaves on the salvia and mistflower, but not the gayfeather. Most of the leaves on the gayfeather were already formed at the time the plants were attacked. The bugs left white scars on the leaves that surely restricted chlorophyll production and left the plants in a weakened state. It could be a race against time to see if the plants can bloom before they die. Compare the picture above taken on 8-24-13 with the picture below taken on 9-14-13. Quite a few stems died in the last three weeks. Anybody else seeing problems like this in their gardens this year? After I took these pictures, I pruned out all of the dead and dying stems. It improved the appearance of the garden, but it is still disturbing that so many of the gayfeather stems are dying. Hmm, this reminds me of the declining health of my four nerve daisies that I mentioned last year and continues into this year. I wonder if there is a connection? Wow, that post was made at this time last year. The garden looked considerably better then. We really need some rain! At least the Salvia greggii is blooming again. People often ask me where I get my plants. Some plants came from independent nurseries, but the majority of my plants came from special event plant sales. I like these sales because they often include less common plants that you cannot find in nurseries. So mark your calendars because three great sales are coming up in the next few weeks. The first sale is this Saturday, September 14 from 10:00 AM to 2:00 PM at the Texas Discovery Gardens at Fair Park in Dallas. If you are a member of TDC, you can go to the preview sale on Friday. Click the link above for more information and a list of plants that will be available. One of my favorite plants from a past TDC sale is Blue Mistflower, Chromolaena odorata. This is the last plant to bloom in my garden each year, if we do not have an early frost. This photo was taken last year on November 17. Click here for a prior post about this plant. The next sale is on Saturday, September 28 from 9:00 AM to 1:00 PM at the Randol Mill Greenhouse in Arlington. This sale benefits the Molly Hollar Wildscape. Click the link for a plant list and additional information. Be sure to visit the Molly Hollar Wildscape, which not at the same location as the plant sale. One of my favorite plants from a Molly Hollar sale is Golden Groundsel, Packera obovata. This is a slowly spreading groundcover for partial shade that blooms in early spring. This photo was taken March 13, 2012. Click here for a prior post about this and other yellow flowers in my garden. The last fall plant sale (that I know of) is at the Fort Worth Botanic Garden on Saturday, October 12 from 9:00 AM to 2:00 PM. The North Central Chapter of the Native Plant Society of Texas will be selling native plants at the event. Click both links for additional information. Plan on spending some extra time enjoying the gardens after you buy your plants. One of my favorite plants from the FWBG sale is my Toothache Tree, Zanthoxylum hirsutum. I also have a closely related Hercules Club, Zanthoxylum clava-herculis, that I obtained at the Molly Hollar sale. (Is it strange that I know where all of my plants came from?) Both trees attract a number of pollinators when in bloom. This photo was taken on April 7, 2012. Click here for a prior post about these trees. The trees also serve as host plants for giant swallowtail butterfly caterpillars. And if you have a toothache, you can chew on a leaf or stem to numb your mouth. I was brave enough to chew on a leaf recently. It did numb my mouth. All of the plants mentioned above will be available at the respective sales. Get there early for best selections. Quantities are sometimes very limited. The dog days of summer continue into September as temperatures continue to venture into triple digit territory. The stress of high temperatures and lack of rain are evident in lake levels, plants and wildlife. Take this squirrel that has been hanging out in my backyard lately. He seems to be suffering from heat exhaustion as he hangs his body over this branch. A few moments later, he turns the other direction in an effort to find some comfort in the heat. Still no relief, so he turns again. Even as I approach, he (or maybe I should have said she?) is too exhausted to acknowledge my presence. The garden looks a little tired too. This is always my least favorite time for my native plant garden. Few plants are blooming and it just looks a little messy to me. I have to keep reminding myself that it is resting in preparation for the burst of life that will come in the next few weeks. In this photo, the spiky stems of Gayfeather, Liatris, are everywhere and the lanky stems of Pitcher Sage, Salvia azurea, are topped with blue flowers. To help control the messy look and prepare for the fall blooming season, I pruned some plants a couple of weeks ago. Some of the plants were pruned more severely than others. There are several Zexmenia, Wedelia texana, in the now open space in this photo. The plants had grown to one foot diameter loose balls of seedheads, so I whacked the plants within inches of the ground to visually open this area and to allow the plants to regrow for fall blooming. I did not prune all of the Zexmenia this severely. I only removed an inch or two of growth from some plants and left others alone if they were still blooming. I was very tempted to cut back some of the Gayfeather so some of the other plants, like this Pale-leaf Yucca, Yucca pallida, could be seen. I resisted the temptation because the Gayfeather are weeks away from being in full bloom. I do think I will remove some of the Gayfeather next year and group them together instead of letting them cover the entire front garden. The Rock Penstemon, Penstemon baccharifolius, were in a down time between blooms, so I took the opportunity to shape the plants by removing a couple of inches of the tip growth. I did the same thing with the Autumn Sage, Salvia greggii. To the right of the Rock Penstemon is a Zexmenia that I did not prune because it was still blooming. This one now has several gray seedheads that rise above the foliage and I may end up pruning them off before the fall blooming starts. I cut back this Mexican Feathergrass because most of the leaves had turned to as straw color. Fresh green growth sprouted quickly. Another shot showing all of the Gayfeather in the garden. This will be a sea of purple in another month. Unlike the spring and fall, flowers are few and far between in the heat of the summer, but they are out there if you look around. The white flowers of Angel's Trumpet, Datura wrightii, are hard to miss when they are blooming in the evening and morning hours. This is one of the plants I mentioned in the last post that sprouted where it wanted to. The red flowers of Scarlet Sage, Salvia coccinea, white flowers of Clammyweed, Polanisia dodecandra, and blue flowers of Pitcher Sage bloom among the inflorescence of Pine Muhly, Muhlenbergia dubia. Some of the brown seedheads from this spring's Echinacea are still around because I find some beauty in them and the birds may eat the seeds. I really like the white, curly filaments on the leaves of this Hesperaloe funifera (?). This is its first year in the garden. I really hope it blooms next year so I can give a positive identification of the plant. It was sold as Giant Red Yucca. These are the flowers of the Pitcher Sage shown in the first garden photo above. The flowers are favorite of bees and hummingbirds. These are the flowers of the Pitcher Sage that grows in the backyard. The flowers of this plant are a darker blue than the flowers of the plant in the front yard and this plant is less upright than the plant in the front yard. Some of the Little Bluestem leaves in the background are beginning to turn colors. Rain Lilies, Cooperia drummondii, bloomed last week, but not because of rain. I think these must have been tricked into blooming because I watered the backyard garden for the second time this year. Skeleton-leaf Goldeneye, Viguiera stenoloba, laughs at the heat and drought and continues to bloom. I will need to find a new location for this plant next year because it blocks the view of the stock tank from the street. I carefully removed most of the Horsemint, Monarda citriodora, seedheads when I was on my pruning spree. These seedheads are full of seeds and I wanted to control the number of seedlings that come up in the garden (and pathways) next spring. I left the seedheads of this plant in tact because they are attractive and this plant bloomed longer than all the others. Salvia greggii blooms in the background. Flame Acanthus, Anisacanthus quadrifidus v. Wrightii, is always a popular stop for hummingbirds. Seep Muhly, Muhlenbergia reverchonii, is not quite as impressive as it's cousin Gulf Muhly, Muhlenbergia capillaris, but it is still attractive and it blooms earlier. The lush green plant in the center of this photo is Prairie Flameleaf Sumac, Rhus lanceolata. It was a small twig when I bought it in January. I am amazed at how much it has grown considering I moved it three or four times before I settled on this spot. I saw one today at the Plano Environmental Education Center that formed a large forest and now I am rethinking the placement of this plant again. Looking to the left of the sumac is a sign that the dog days of summer are beginning to come to an end. The Eryngo, Eryngium leavenworthii, is one of the first late season flowers to begin blooming each year. The plants are often unattractive and the leaves are spiny, but those purple flowers are tough to beat. Another sign that summer is coming to a close is that the berries on American Beautyberry are turning purple. This shrub is native to east Texas and prefers a little more water than it gets in my garden. As a result, the leaves often wilt during the hot, dry times of the year. This morning the garden received a little relief from the dog days of summer in the form of rain and slightly cooler temperatures. It was only enough to make things wet, but I will take any rain that I can get. I took a few pictures of the wet garden. These are wide shots because I periodically receive requests to show different angles of the garden. Wide Shots is also the title of Xericstyle's new meme. The idea is to post a wide shot of the garden on the first of each month. Below are two wide shots of the front garden and two wide shots of the back garden. This is the front garden looking southeast. Back garden looking southwest. Go to the Xericstyle blog to see her Wide Shot for September.